Birth Friday, 21 December 1860 in Avisford House [left], Walberton, Sussex [registered unnamed in Westhampnett, March 1861]. Baptism 16 April 1861 at Holy Trinity, Chelsea. According to the 1861 census, the as yet unnamed John is the youngest of three children to Sir Christopher and Georgina Maria (née Sidebottom), living at Avisford House in Welberton in West Sussex. His father is a retired (in 1859) chief justice of the supreme court of judicature at Madras. They have eight servants. According to the 1871 census, John F.P. is still the youngest of three still living with their parents, living at 89 Eaton Square at Belgravia with seven servants. His father is still retired. According to his University Alumni, John was admitted to Trinity College on 11 June 1879. According to the 1881 census, John F.P. is lodger with the Millers while attending Trinity College in Cambridge. He is an undergraduate student of law living at 7 Bridge Street in Cambridge. According to the 1891 census, John is a barrister at law lodging with the Barker family at 2 Little St. Mary's Lane in Cambridge. "The Queen has been pleased, by Letters Patent under the Great Seal, to appoint.... John Frederick Peel Rawlinson, of the Inner Temple, Esq., LL.M., to be of her Majesty's Counsel learned in the Law." - Saturday, 27 November 1897, Morning Post. According to the 1901 census, John is a solicitor for the Kings Counsel, living at 5 Crown Office Row in the Temple area of London. According to the London Electoral Registers, John is registered at 5 Crown Office Row since 1900 until his death in 1926. According to the 1911 census, John is member of the King's Counsel, living with a nurse, servant and a clerk still at 5 Crown Office Row. "LORD ALVERSTONE'S WILL.�Estate of �311,000. "Estate of the gross value of �311,373, including personalty of the net value of �199,986, is left by Viscount Alverstone, G.C.M.G., formerly Lord Chief Justice of England, of Winterfold, Cranleigh. Probate of the will dated July 26, 1909, with codicils of January 27th and February 7th, 1915, is granted to.... John Frederick Peel Rawlinson, K.C., M.P., of 5, Crown Office-row, Temple; Testator gives....�100 to John Frederick Peel Rawlinson." - Wednesday, 22 March 1916, Surrey Advertiser. Death: Thursday, 14 January 1926 at 5 Crown Office Row, Temple, London, aged 65 years 24 days [registered in London City, March 1926]. He died in his chambers where he had been confined for ten days with pleurisy. Buried at Brookwood Cemetery (left) in Woking, Surrey. "Deceased left �3000, after a life-rent, to be divided equally between the Rawlinson Fund at Cambridge University and the Provost and Fellows of Eton College for the benefit of Eton." - Saturday, 20 March 1926, The Scotsman. "Mr. John Frederick Peel Rawlinson, K.C., the senior Unionsist member for Cambridge University, who recently conducted the Shephard police inquiry, died in the Temple on Thursday. "The son of a Chief Justice of Madras, Mr. Rawlinson completed his 65th year just before Christmas. He was called to the Bar in 1884, and in 1896 he represented the Treasury in South Africa in the investigation of the causes of the Jameson Raid, his services being recognised a year later, when he was given silk. He was appointed Recorder of Cambridge in 1898, and two years later became Commissary of the University. "Mr. Rawlinson's first attempt to enter Parliament was made in 1900, ehen he unsuccessfully contested Ipswich in the Unionist interest. At the next General Election, in 1906, he was elected for Cambridge University, which he had represented for the past 20 years. For the last two years he had as his colleague in the representation of the University Sir Geoffrey Butler. At the last election they were opposed by an Independent. In his younger days he played football, and was a well-known goalkeeper." Adm. pens. at TRINITY, June 11, 1879. [Yst.] s. of [Sir] Christopher (1823), of The Lawn, Swindon, Wilts. B. Dec. 21, 1860, at Airsford. Hon. LL.D. 1920. Hon. Fellow of Pembroke. Commissary, 1900-26; Deputy High Steward, 1918-26. Football (assoc.) 'blue,' 1882, 1883; played for England, 1882. Adm. at the Inner Temple, June 18, 1881. Called to the Bar, June 25, 1884. Q.C., 1897. Bencher, 1907. Represented the Treasury in the inquiry after the Jameson Raid, 1896. Recorder of Cambridge, 1898-1926. M.P. for the University, 1906-26. Member, General Council of the bar from its formation; later, Vice-Chairman. Temporary Chairman of Committees, House of Commons, from 1916. Author, Rawlinson's Municipal Corporations Acts. Club(s) Attended Eton College and then Cambridge University, earning his blue in 1882 and 1883; also turned out for the Corinthians FC in 1882, when he also became a member of their committee. Player number One of seven who became the ninetieth players (90) to appear for England. Fourteenth goalkeeper to appear. Only match No. 14, 18 February 1882, Ireland 0 England 13, a friendly match at Knock Ground, Bloomfield, Belfast, aged 21 years 59 days. Distinctions Served on the FA Committee between 1885 and 1886. 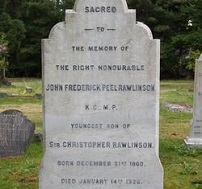 "In the year 1860 the late Sir C. Rawlinson, on the conclusion of the nine years' term of his discharge of the duties of the office of Chief Justice of Madras, conferred on the fortunate world the service of becoming the father of Mr. John Frederick Peel Rawlinson. After a childhood of an uncommon liveliness, Mr. Rawlinson was sent to Eton; and at that ancient seat of learning he husbanded his power of work with so able a discreetness that he was never suspected of the possession of that abounding mental energy which his later career has so continuously displayed. On the other hand, he set about aquiring that skill in shooting which has made it his solace for three and thirty years, and that skill in football which later led to his representing England gallantly in the International games, and made him a leading member of the Association Football Committee. On leaving Eton for Trinity College, Cambridge, he began to give his mental energy full play, and addressed himself to the study of law with that keenness which has distinguished him in all the pursuits which have excited his interest. On leaving Cambridge with the degree of LL.B., after taking a First Class in the Law Tripos, and becoming a Prizeman in Common Law, he became the most distinguished pupil of Mr. Justice Bray, and in the year 1884 was called to the Bar. As a Cambridge man he naturally joined the South-Eastern Circuit, and varied the practice of his profession by acting as Lecturer and Examiner in Law at Pembroke College, Cambridge. In the years 1891 and 1892 he represented the University of Cambridge in the famous Spinning House trials; and in 1896 he represented the Treasury in the inquiry, in South Africa, as to the circumstances of the Jameson Raid. That gave him the opportunity of making the acquaintance of President Kruger, and in spite of Mr. Rawlinson's staunch Imperialism they were presently on the friendliest terms. In the year 1897 Mr. Rawlinson took silk, and in 1898 succeeded Mr. J. R. Bulwer as Recorder of Cambridge. Soon afterwards he began to seek to combine politics with the practice of law, and in 1900 contested Ipswich, without success, in the Conservative interest. In the same year he was appointed Commissary of Cambridge University, a post which he has held ever since. In the year 1906 he was elected Unionist Member of Parliament for Cambridge University in 1906. To the discharge of his Parliamentary duties he brought the extraordinary keenness he has always displayed in his profession. He opposed the Education Bill clause by clause in many speeches; he conducted the opposition to the Criminal Appeal Act; and he was one of the gallant and strenuous thirty who saw the last, long-drawn-out session to the bitter end. His avocations, legal and political, pursued with so strenuous a keenness, the calls upon him arising from the wide popularity his geniality has won him, have never left him time to marry; but such is his dignified fortitude that he contrives to speak of the holy estate of matrimony he has failed to attain without tears either in his eyes or voice." - NOTES AND NEWS FROM VANITY FAIR�MEN OF THE DAY�Friday, 10 January 1908, Shipley Times and Express/Herts & Cambs Reporter & Royston Crow.